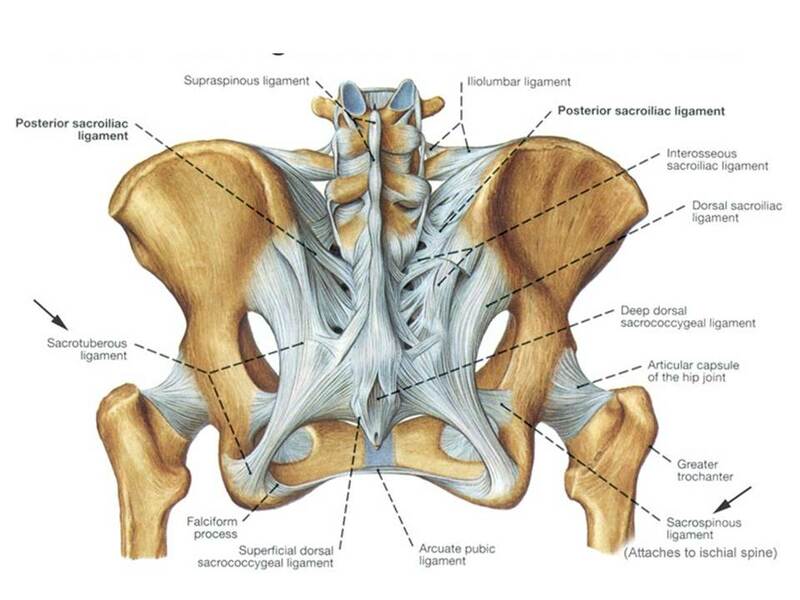 In a previous blog, the sacroiliac joint has been discussed as a source of lower back, buttock and posterior leg pain. The importance of stability has been discussed in Ortho 2.0. There are 4 central components: Stability, Articulation (joint), Neuromuscular, and Symmetry (SANS). Treatment options of sacroiliac joint dysfunction at the Centeno-Schultz Clinic include prolotherapy, PRP, IMS and autologous stem cell therapy. 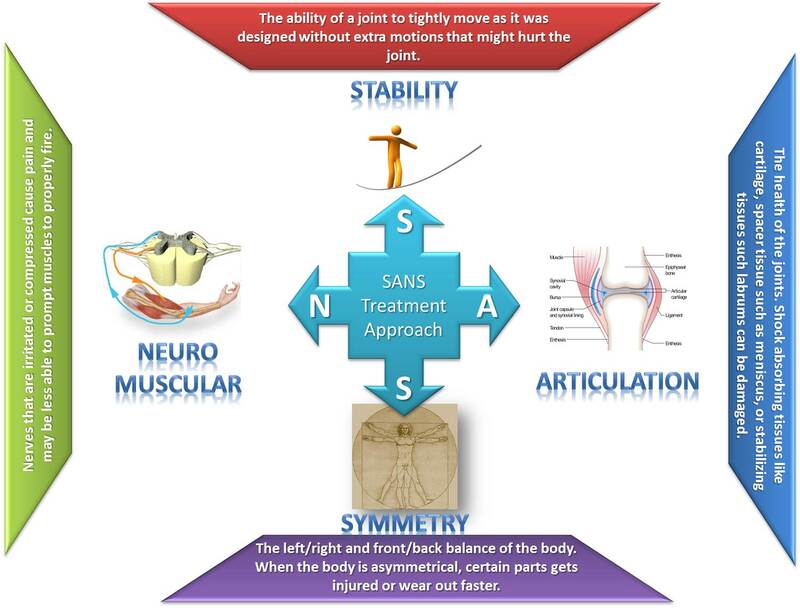 The stability of the SI joint is dependent upon the integrity of the supporting ligaments. Dorsal sacroiliac ligament: joins the sacrum and the ilium and is composed of the long and short posterior SI ligaments. iliolumbar ligament: stretches from the transverse process of L5 to iliac crest. sacrospinous ligament: triangular in shape attached by its apex to the ischial spine and medially, by its broad base, to the lateral margins of the sacrum and coccyx. sacrococcygeal ligaments: stretches from the sacrum to the coccyx and thus dorsally across the sacrococcygeal symphysis. Sacrotuberous ligament: stretches from sacrum to the tuberosity of the ischium. At the Centeno-Schultz Clinic we acknowledge that foot pain can be disabling and affect your game. 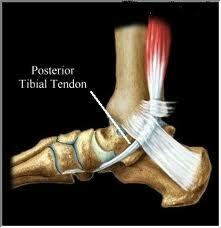 Posterior tibialis tendon dysfunction is a common source of medial foot pain and instability. Stability is critical and is one of the four central components as discussed in Ortho 2.0. Tendons connect muscle to bone. The posterior tibial muscle originates in the lateral part of posterior surface of tibia and medial aspect of the fibula. It runs down and behind the inside bump of the ankle (medial malleous) and attaches to the bottom of the foot. The bulk of the tendon inserts on a prominence on the medial aspect of the navicular. This prominence is called the navicular tubercle. The posterior tibialis muscles act to plantarflex the ankle and invert the foot. It is also medial ankle stabilizer. Presentation: primarily occurrs in women who are middle-aged or elderly. Patients commonly complain of pain in the inside of the foot and ankle with radiation into the arch of the foot. On physical exam there is pain along the course of the tendon and often patients are unable to stand on their toes on the affected side. Visualization is critical for effective clinical outcomes. At the Centeno-Schultz Clinic MSK ultrasound is used both diagnostically as well as with tendon injections to ensure accurate placement of regenerative agents. Prolotherapy, PRP and autologous stem cells are treatment options when conservative therapy has failed. 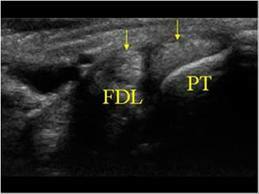 Below is an ultrasound image of the posterior tibialis tendon at the level of the medial malleous.